Wroom, wroom! Get on, start the engine, gear up, ready for the green light, release the brake, start! That’s what a good motorcycle race should look like at the beginning. 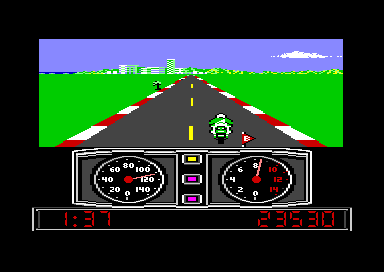 In Super Cycle by Epyx it’s almost exact. Let’s talk about it more. 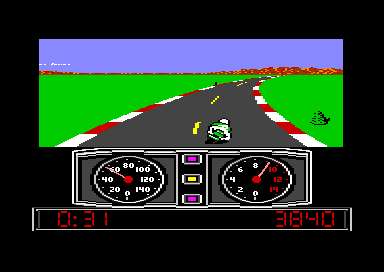 The game has been made by the American developer Epyx in 1986 for the Commodore 64 computer, and this version is the best of all the 8-bit versions. 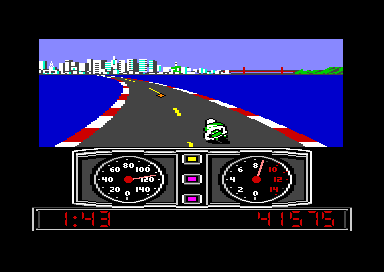 The game was released for the 16-bit Atari ST as well, but we’ll focus on the 8-bit stuff here. The game itself is… well, a regular racing game. With motorbikes. Your aim is to win the race against other bikes, reach the best score and not to run out of time. The main race starts immediately, no qualifying. After every three ordinary racing circuits – every single one in different environment – there’s a bonus round where you pick little flags that someone had put on the road. 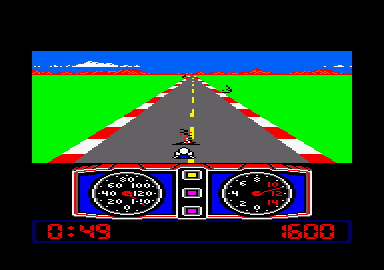 Especially on the C64, the gameplay is very smooth and fast. You can clearly see that a turn is coming, and the opponents are kinda intelligent. They tend to block your way when you’re trying to overtake them. The centrifugal force throws your bike to the side, and you have to stabilize the optimal position. The bike has three gears, and they have to be changed optimally. Therefore there’s a tachometer and the handle should never get to the red area. If everything goes clear and you get the finish line, you get extra points depending on the time you reached or amount of flags you picked up in the bonus round. In the main menu you can choose from one of three difficulties. The highest one is really tough and you really have to study the turn order to drive through. The time limit is tighter as well. What makes the game good is the fast, yet smooth gameplay. Driving a bike running 140 MPH is really enjoyable. 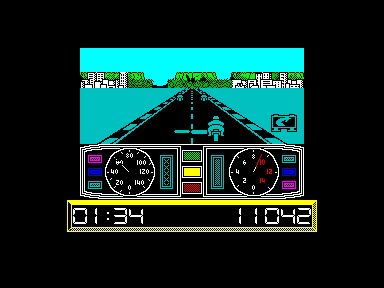 This applies to the original version on the C64. The other 8-bit versions have their, let’s say, disadvantages. Some of them are pretty worrying. 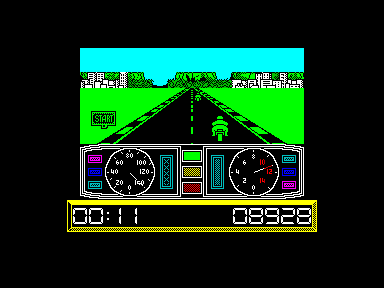 I’ll give you an example: on the Amstrad CPC, oppenent bikes can scoot you down from rear, so when you crash and try to speed the bike up again, you must take care of your back not to be kicked down. The game looks good, though. The only superficial difference is in sounds. The game physics is different, too, so if you’ve just switched from the C64 version to test the CPC game, you’ll probably notice huge differences in the gameplay. However, this doesn’t affect the CPC version in its complexity much. The game is just a little different, not in a bad sense, and it’s still an excellent conversion made by U.S. Gold. The British U.S. Gold has converted this game to the Spectrum as well. The result is satisfying, but not perfect. It was done in a hurry, as far as I know, the authors had just one day to finish the conversion. But having this in mind, the result is pretty astounding. The gameplay is not as catchy as on the C64 or CPC, though. First, everything is way too slow. Second, there are traffic signs telling the turn is near, but the player doesn’t see the beginning of the turn at all! Simply, you just ride and suddenly there’s a left or right turn. Third, the flags in the bonus round don’t make any sensible path, so you must a) remember their positions or b) be quick and try to pick all of them, which isn’t that easy. But the most unpleasant feature of the Spectrum conversion is that the game never ends. You just play round and round till 99999 points and then the score counter displays random characters and you’re still going on. No victory here. 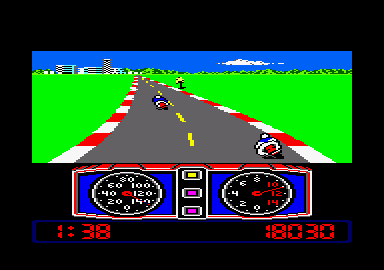 Super Cycle is a catchy, fast, pacey motorbike racing game that is worth a try mainly on the Commodore 64, but the CPC version also plays well. The Spectrum loses big time here, although it contains quite nicely drawn graphics. To get the most of it, grab the C64 version. Then try comparing. At the end, I think you’ll get back to the Commodore.